Interview with Russ Hermann and Tom Zubrycki conducted by Robert Randall and Frank Bendinelli for Access Video, vol.5, no.4 (Spring 1979). Russ Hermann and Tom Zubrycki are independent video tapemakers and the organisers of Video Mayfair, held at the Sydney Filmmakers Co-operative during May of this year. Tapes such as The Painters and Dockers' Strike and Sack Black - Democracy in the BLF typify a fresh, innovative style of video tape production. The latter tape represents a study of the inside workings of a union election campaign. They followed the Builders Labourers for Democratic Control candidates on the campaign trail, videotaping on-the-job meetings, planning sessions, as well as confrontations between opposing teams. Recently, they were interviewed by Robert Randall and Frank Bendinelli for Access VIDEO. How did you get involved in community video? RH: I started in video in November 1975; a fairly easy date to remember because I did a video course at the Film and Television School the week of the sacking of the Whitlam Labor Government. One of my tutors was Jeune Pritchard and one of the people in my group was Jenny Neil. The three of us used to race over and tape all the demos, and it was a great way of getting right into what video is all about. At the time, I was an unemployed builder's labourer and I'd been on the dole for about eight months. TZ: I was teaching sociology at the New South Wales University and I was getting more and more alienated because institutions such as universities are extremely remote from the community and things that are happening outside the establishment. I became interested in video and social change. This happened through reading some Canadian magazines. In fact, I wrote an article about video without even touching a video camera. The first tape I did was of a big bicycle rally. I didn't realise it, but I was using low density tape in a high density portapak and I had all these black traces going through the tape. That same night I left the tapes in my Mini Moke. The following day the car disappeared, along with the first tapes I ever shot. How did you become involved in co-productions? RH: Tom was employed at the Marrickville Information Centre. I met him at the Centre and then found him at every party I went to. We taped a number of community music concerts for the Greek community and ran a number of video courses together. The co-productions and friendship developed from there. I have also made tapes with other Sydney video freaks while Tom concentrated on his film. TZ.. It's about the Green Ban movement from the early 'seventies, when the Builders Labourers Federation (BLF) was protecting the inner city houses against demolition and property developers until the present time, when the community can't decide what to do with the land. The area is presently owned by the Housing Commission, which intends to redevelop the land into high-rise town-houses for low income earners. The local Resident Action Group is fighting the plan and wants to retain the houses. The film has been a long-term project and is nearing completion. Tell us about the tape, Sack Black Democracy in the BLF. RH: To understand the tape some knowledge of the BLF's past activities is important. The NSW branch of the BLF was very militant in the early 1970's, when they linked with inner city residents and imposed Green Bans where private or State Government development threatened residential areas. The Master Builders Association tried every means possible, including deregistration, to break the NSW branch. When all these efforts failed they enlisted the aid of Norm Gallagher, the Federal Secretary of the Union. After a bitter struggle, all the NSW officials were expelled from the union and denied the right to work in the industry. Since then Gallagher's men have been in power. As the tape states, in 1976 all the NSW people were declared ineligible to stand for election. The 1978 election was the first chance people had to challenge the leadership and they called themselves Builders Labourers for Democratic Control. Due to our previous involvement with the BLF, we decided to document the election. We shot 13 hours of tape, which was an experience to sit through and edit. Unfortunately, we ended up documenting a loss which no tapemaker really wants. How did you overcome that problem? TZ: We had to create the impression that the struggle was a continuing one, even though the Builders Labourers for Democratic Control lost the election. The tape is going to be used in the next BLF election campaign. How does the union's rank and file feel about the finished tape? TZ: The general reaction is positive. At present the tape is 40 minutes long and has a 10 minute historical section about the heavy days of 1973 with Jack Mundey, Joe Owens and Bob Pringle. This version was recently shown to some rank and file unionists, and they requested the removal of the historical section because the main issue concerning the union today is unemployment. Unfortunately, the Green Bans issue takes second place. I think the Green Ban philosophy is still a very strong one for the rank and file, but in order to get across to a large number of workers it cannot be overstressed. How did you get the rank and file to accept your presence on sites? RH: We had little difficulty since I was a builder's labourer and some of the workers knew me from the old days, others had heard about Tom's film. Video equipment could only be taken on jobs which were strongly for the Builders Labourers for Democratic Control. TZ: The other important thing was that in order to justify what we were doing we needed publicity. We therefore gave a lot of emphasis to tape playback. The tape was shown on job sites and at meetings which we held weekly at the Sussex Hotel, in the city. This playback gave us a lot of support on a number of jobs. I believe video changed some of the workers' attitudes and feelings about the election. It allowed them to distance themselves just slightly from the process of campaigning and rethink and analyse the main issues. RH: Also the video playback sessions were a means of collecting funds for the Builders Labourers for Democratic Control. It was a long campaign and most of their money was spent on brochures and pamphlets. One of the main jobs that money came from was the Qantas job, and when the money was lagging a bit they would ask us to show an updated version of the tape. What role do you think video can play in industrial disputes? RH: A most important role is to get over what really happens in a strike. Non-union people who have seen the Painters and Dockers' tape have been amazed how well the workers were organised. Dealing with unions during strikes is always a tricky problem, because the union consists of the rank and file and the elected officials - the official leaders. A good militant rank and file might not necessarily support the leadership, and that is always a problem. Which one do you work with? I prefer to work with the rank and file. TZ: Also, during a strike video playback allows constant re-evaluation. It gives the worker an idea of how positive their organisation was and what are the major issues. Secondly, it can be used as a total product to remind the rank and file of a particular struggle they have fought in the past. It records their tactics and the success they have had in mobilising their forces. So it has a very strong historical value, not only for that particular union but also for other unions engaged in strikes. The structure of the tape Sack Black, I feel, was influenced by the video medium. I believe that if the tape had been shot on film the end result would have been different. Do you agree? TZ: Completely. With video it is possible to record for a very long time without stopping. It also requires very much less organisation and preparation. If Sack Black had been shot on film we would have had to worry about some kind of financial backing. Video allowed us to record meetings - of the 13 hours of tape shot, two-thirds was taken up with recording meetings. It then allowed us to sit down and piece together the decision-making process which takes place. It is very important to show this. The Builders Labourers for Democratic Control wanted to show how decisions were made openly after the issues had been debated and each person had the opportunity to throw in various points. Video allowed us to concentrate on how, step-by-step, the campaign went on. Not simply by us stating it on the tape, but by using the words of the people involved in the campaign. It allowed the workers to speak for themselves. RH: The other thing is that, with black and white video, we could operate on much lower light levels than with colour video or film. So, in a sense, we were much more unobtrusive. Did you involve the union's rank and file in the editing process? TZ: Russ and I often conflicted on what extent the rank and file should influence that decision. He felt very strongly that since it was a rank and file tape they should be brought into the editing process. At the same time, I wanted to include points which would illuminate the situation for a general audience. I think we managed to do both. We involved the rank and file in the editing process by showing them rough edits. We noted their comments and made changes to the tape. Rough edits were extremely important, both ethically, because of the nature of our relationship with the rank and file, and technically, because it allowed us to stand back and observe. How do you plan to distribute the tape? TZ: Videomakers haven't applied themselves to distribution. We've had to peddle our tapes around groups and show them at meetings. I think that is one extremely important method of distribution. On the other hand, we should take notice of filmmakers and start putting out brochures and mailouts to tertiary education institutions and so on. Sack Black has a place in there. We don't just see trade unions as the only source of distribution; there are universities and colleges where it could be usefully used to focus attention on rank and rile organisations. It has always been traditional with the video medium to do something quickly, getting it finished, showing it to a group and then perhaps forgetting about the tape. Now what we are finding is that there has been much more emphasis on "quality" of product. As a result of the time spent in making the tape you just can't shelve the tape once it's had a few screenings. You have to move into another stage of working rather solidly in getting it shown as widely as possible and taking it to all areas. Do you think that we should start a distribution network through the video access centres? RH: I think so. There is very little interaction between tapemakers interstate. We see very little of what is being done in other parts of the country. Video Mayfair has given us a chance to review tapes made elsewhere in Australia. What is the future of Video Mayfair? TZ: I think we will continue with the existing structure and presentation. The selection of the tapes will continue to be based not so much on technical competence, but on the treatment of issues, which is of interest to a general audience. We will have to devote more time to publicity. We must get across to the general public. Video Mayfair must continue. People, hopefully, will become more and more accustomed to watching video tapes and judging them the same way that they would film. What about your future, Russ? RH: I have a real problem. At Western Access we only use black and white equipment. There were only three black and white productions shown at Mayfair and I was involved with two. I would like to be using colour, but that puts me in a real bind. RH: Well, last year I produced seven tapes, including Sack Black, which was equivalent to three of the other productions. Probably, for the next three months, I will be producing a contemporary political record. Things are very fluid. I'm thinking a lot about the future, but I'm not in any particular hurry. TZ: I have ideas of going overseas with the tapes we've made and try to see how they go when viewed by a totally different audience. I need a rest. I'm very aware of the time and energy it takes to produce a tape and I would be wary of involving myself in one in the near future. 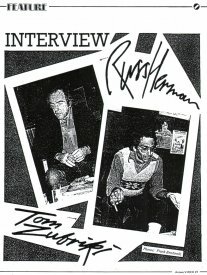 The image page leading into the interview Feature in Access Video, vol.4, no.5.